The PR team at HootSuite has recently been on the hunt for tools to make our jobs a little easier. We narrowed down our selection to three front-runners, and reached out to each of them individually (via their websites) to learn more about their services. A day went by. Then three days. Five days later, only one of the three companies had responded with an eager invitation to schedule a call. Having little knowledge about the remaining two, we took to the masses on a popular social network – we sent a Bat Signal to other PR pros to see what their preferences and experiences were with each of the choices. Then something magical happened. Like bees to honey, they came – almost immediate responses from the companies that were, just a few days ago, MIA. It’s incredible to see just how powerful a player in social media customer service has proven itself to be. Not only are brands able to engage with their consumers, but consumers are empowered with the means to directly interact with their favorite brands. It’s hard for brands to ignore you when they’ve been called out in the open, where everyone can see. The last thing they would want is for an influencer to post a complaint, paving the way for other customers to lash out about their negative experiences. Hearing back from companies on brands on social makes us feel valued as [potential] customers. But with the thousands of mentions and messages that brands are receiving every day, you can feel lost in the crowd. Use the right handles and hashtags. When sending a social message, look up your favorite brands’ Facebook pages and Twitter handles – usually, these will be verified so you can determine which ones are the real deal. That way, you’ll know you’re sending messages to the right place. Be sure to also look out for official hashtags for a specific event or product. Brands often use these to keep track of certain campaigns, so your message is more likely to be seen. 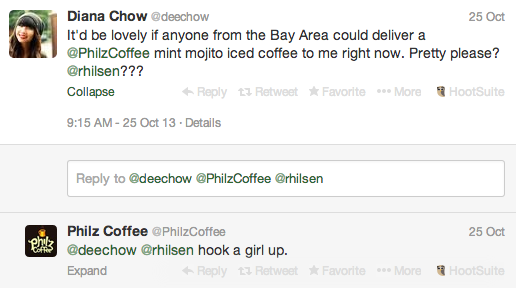 Pro tip: Some brands have multiple Twitter accounts for different departments, especially for customer service (e.g. @HootSuite vs. @HootSuite_Help). Do a quick search to scope out other handles that are best suited for what you’re looking for. Get involved in the conversation. Once you’ve found the right Twitter handles, Facebook page names, and hashtags, get in there and join the conversation. Ask and answer questions, Retweet, and ‘Like’ away. Often, the social media accounts of a company are handled by the same person (or same team) who just might recognize your name if you’ve contributed a few times. The familiarity could work to your advantage the next time you’re on the lookout for a helping hand. Pro tip: Brands often hold Twitter Chats to engage on relevant topics with their followers. This is a great time to ask questions and get your voice heard. Follow up. No reply? Don’t fret. Remember: brands receive lots of social messages on a daily basis. Send out a friendly reminder about your inquiry and post on multiple social networks. Getting back to customers in a timely manner is often a big key performance indicator (KPI) for social media teams, so it’s more than likely that you’ll receive a response sooner rather than later. Pro tip: Try posting on different social networks. A brand might have missed your Tweet on their timeline, but they may have a better view on their Facebook page. The plus side? Facebook doesn’t have the same 140-character restriction, so you can express without stress. Have you had any praiseworthy customer service experiences with brands through social media? Tell us about it! Are you a brand or business owner that’s looking for tips on how to better engage with your customers this season? Check out this white paper with “8 Social Media Tips for the Retail Industry”.